Here’s a Facebook post from a philosopher, Joseph Agassi. Agassi studied under Karl Popper. 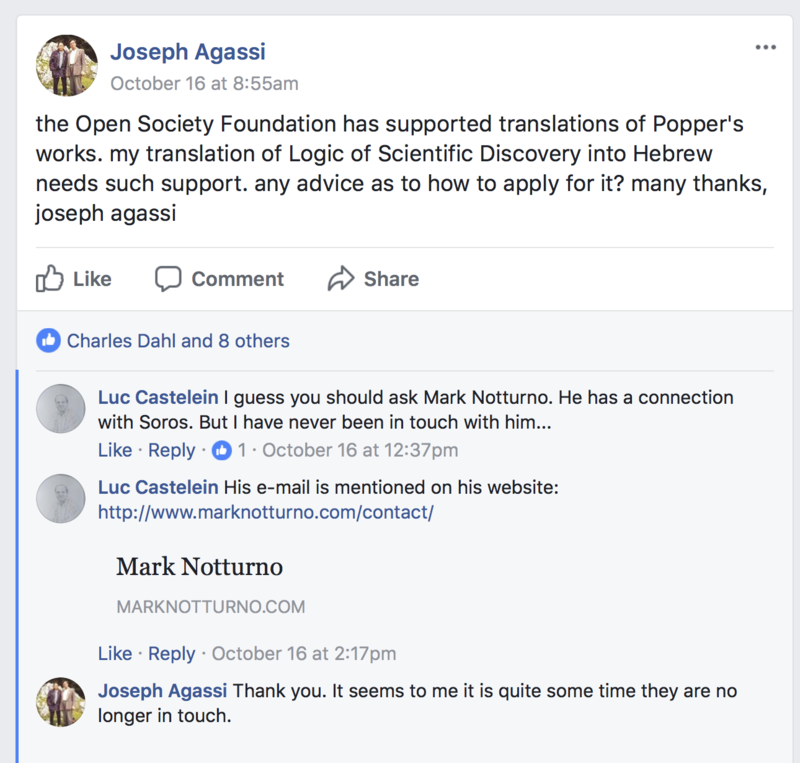 Agassi wants money from George Soros to support a translation of one of Popper’s works into Hebrew. Left-wing billionaire George Soros has transferred $18 billion to his Open Society Foundations, the primary vehicle for his global political activism and philanthropy. Though Soros’s foundation was originally aimed at fostering “open societies” as opposed to authoritarian systems, in recent years the foundation’s work has supported dogmatic, aggressive left-wing groups that disrupt liberal democracy and stifle opposing voices. Soros has funded the Black Lives Matter movement and is considering bankrolling the so-called “resistance” to President Donald Trump. He also backs Media Matters, a so-called “watchdog” group that spends most of its energy trying to eliminate conservatives from the media. Agassi should find better people to ask for money.